From September of 1941 through May of 1945, Norwegian Resistance pioneer Lauritz Sand was alternately beaten and broken, then treated, then beaten again by Nazi interrogators. And despite enduring four years of the hardest torture they could dole out, all while in his 60s, he steadfastly refused to tell them anything. In response to the horrors of WWI, Norway’s leaders had engaged in a policy of disarmament that left their military relatively weak by 1940. Thus, when the Germans invaded in April of 1940, the country was ill-prepared to defend itself. Nonetheless, Norway’s government and its king were able to evacuate the country and evade being forced to agree to accept the “protection of the Reich,” which impeded Germany’s ability to legitimize its hold on the country. Almost immediately, Norwegians from all walks of life also began to resist the German occupation, including military units in the North of the country engaging in active campaigns and its merchant fleet helping to transport Allied troops and supplies. In addition, sabotage operations were conducted by small groups across the country, while others worked as “spotters,” identifying German warships and transmitting the information to the Allies. The Norwegian resistance also smuggled people out of, and expert fighters into, the country, including saboteurs and US OSS (the precursor to the CIA) forces. Providing training and equipment, soon there was a strong intelligence operation ongoing on behalf of the Allies in the occupied country. Lauritz Sand was born in Norway in 1879 and served in the Royal Dutch East Indies Army after studying architecture in the late 19th century. He later joined up again to serve in WWI and afterwards became a relatively successful businessman. In the years leading up to WWII, he had been living abroad but returned to Norway in 1938 at the age of 59. When WWII broke out shortly thereafter, he decided to forgo previous plans of once again living abroad and remained in Norway. When the Germans invaded in 1940, he joined the resistance movement. Sand’s WWII intelligence work was short-lived, however, as he was betrayed by a German military intelligence operative, Laura Johannesen, who infiltrated XU in September of 1941. As at the time of his arrest he was carrying sensitive, incriminating documents and he was known to be one of the leaders in this particular group of resistance fighters, he was soon sent to be dealt with by the Gestapo. Brutally tortured, by the time he was transferred from his first interrogators, Sand’s legs and arms were broken and he had serious wounds to his head and back. But the Nazis were not through with him. They knew an awful lot of information about parts of the Norwegian resistance was locked up in Sand’s head and they were determined to get it. Over the next three and a half years, Sand was alternately systematically tortured, kept in solitary confinement, treated in hospitals, and kept with other prisoners who tried to tend to the elderly Sand’s many wounds as best they could. As he refused to disclose any information whatsoever to his captors, he soon became a symbol for the Norwegian Resistance to rally around. Ultimately giving up on ever getting anything out of him, the Nazis scheduled Sand’s execution, by firing squad, for May 17, 1945; however, as they officially surrendered on May 8, 1945, he was spared this fate and, remarkably given all he’d been through, survived the war. 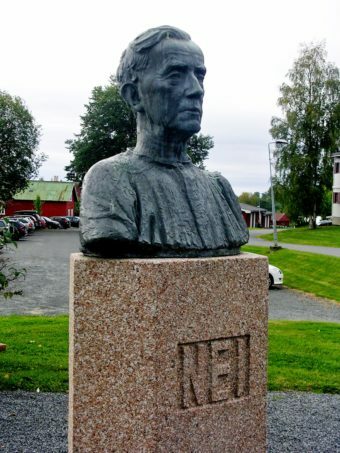 Shortly thereafter, Sand was awarded the prestigious Royal Norwegian Order of St. Olav, and his bust was commissioned. This ultimately bore his likeness and the single word, “Nei,” meaning “No”- meant to represent his absolute refusal to give up any information to his interrogators despite years of brutal torture. He died on December 17, 1956 at the age of 77.